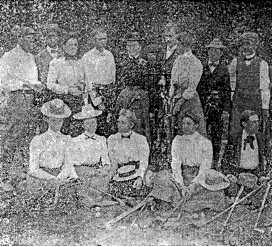 A gala occasion was celebrated in Nordhoff on Saturday, January 14, 1899, when the first golf course in the valley was opened to the public. Mrs. Mary Gally had supervised the laying out of the course north of the Gally Cottages with the help of some easterners who knew something about golf links. The greens were patches of sand. Buckets of wet sand hung on posts at the beginning of the fairways for the use of the players in making their tees. Bunkers were made of strips of three-foot wire – netting placed on the top of one-foot ridges of earth. Burned-out hollow stumps and many squirrel holes dotted the fairways. 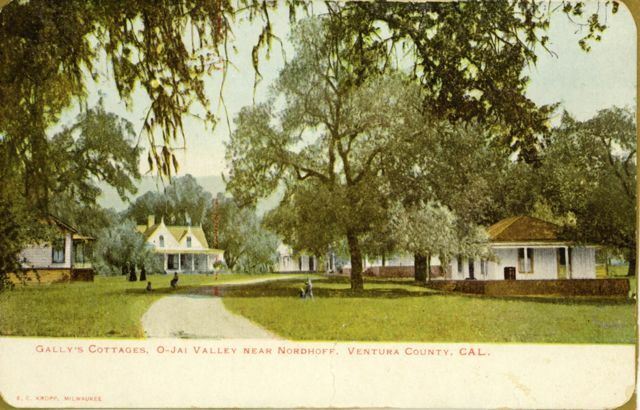 The game was a great novelty to the residents of the valley. The players on the opening day, mostly visitors from the east, were followed from hole to hole by the wondering “natives” who chattered continuously, asking the names of the various clubs, how to score, etc. At the close of the formal opening, refreshments of ice cream, cake and preserved ginger were served at the Gally Cottages. Players on the course paid 15c for one-half day; 25c for one day, $1 for one week, $2 for one month, and $10 for the season. Caddies were paid 10c for nine holes, and 20c for an eighteen hole round. A ball fastened in the netting of any bunker must be dropped behind the same and within a club’s length without penalty. A ball driven onto the ploughed ground or grain field may be dropped at the point where it left the course under penalty of one stoke. If ball goes into a squirrel hole, it may be dropped behind the hole, or if unrecoverable another ball may be dropped in its place without penalty. All stones and pebbles, loose branches and twigs may be removed, provided the ball is not disturbed. If the ball lies on a stone it may be dropped behind the same without penalty. A ball is in unplayable position near the stumps may be dropped behind the stumps without penalty. One of Howard Gally’s childhood memories of the early days of the golf course was his mother’s indignation upon learning that her smallest son had been held by his heels and lowered into a burned-out hollow tree by a player to retrieve his ball. Today Howard says he still finds parts of long-lost golf balls in the area where the course was located. MARY GALLY – standing in the middle of the back row. In the same group are Willian Thacher and Mr. and Mrs. Harry St. Claire.